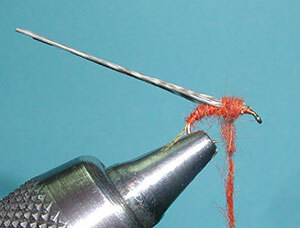 Notes: This fly was originated by Andy Burk for PMD hatches on the Fall River in Northeastern California. 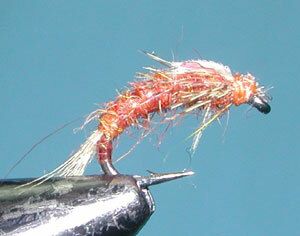 Andy worked as a guide and noticed a drop-off on the hits of Pheasant Tail Nymphs. He discovered that the trout became accustomed to the PTN and declined the offering. Part of the problem was translucency and a hunchback configuration. 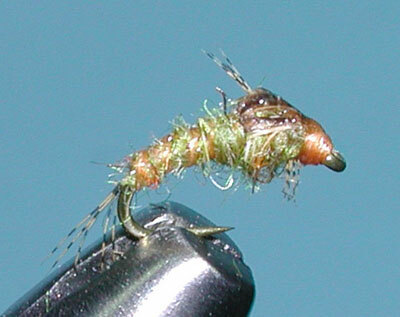 Andy resolved this by selecting a scud-type hook and utilizing a rust-colored rabbit dubbing that matched the nymphs color but also gave a fibrous translucency to the fly. 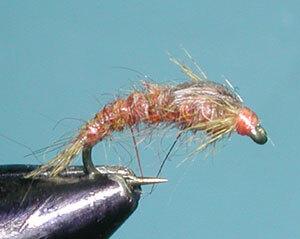 The fly is used as a primary nymph pattern for PMD's but can also be used for Baetis hatches. Use of a Scud-type hook is also found on John Barr's Emerger and is excellent in producing the natural curvature of the nymph. Use of a rabbit blend is also found in many excellent nymphal patterns such as Kauffman's Nymphs. The blends give a more realistic coloration and the rabbit dubbing will sink easily into the water column. Andy found the the naturals had a rusty orange color that had a translucent quality. By applying the dubbing in a somewhat loose wrap, the appearance of translucency is achieved.